본 논문은 지난 2013년 10월에 3부작으로 제작․방영된 KBS 역사 다큐멘터리 <의궤 8일간의 축제>을 중심으로 TV 역사물의 고증 한계와 그 대안에 대하여 집중적으로 살펴보았다. 이를 간단하게 요약해 보면, 먼저 관련 작품의 역사 고증에 대한 문제에 대하여 TV 역사물 제작과 관련하여 사극의 경우 제작진의 입장은 주로 작가의 창작성에 기반 한 예술적 산물이기에 고증에 집착하는 것은 극의 창의성을 가로막는 장벽이 될 수 있다는 점이다. 반대로 교육계 및 역사학계에서는 사극이라 할지라도 역사의식과 직결되는 교육적 가치가 크기에 고증에 좀 더 객관적이고 치밀함을 강조하였다. 양쪽의 의견 모두 현장의 상황을 반영하고 있기에 무조건적으로 비난할 수는 없다. 그러나 TV 역사물 중 사극의 고증 오류로 인하여 발생하는 또 다른 문제는 가장 사실적이어야 하는 역사 다큐멘터리에서도 그러한 문제가 반복된다는 것이다. 구체적으로 KBS 역사 다큐멘터리 <의궤 8일간의 축제>에 드러난 고증 상의 문제 중 정조의 호위무관이 일본도를 일본도 패용 방식으로 착용한 것을 비롯하여 대표적인 여섯 가지의 고증 오류를 지적하였다. 그리고 이러한 TV 역사물의 고증 한계를 극복하기 위하여 지나친 시청률 지상주의 폐해를 극복해야 하는 것과 관련 방송 콘텐츠의 사전제작제 등을 비롯한 일곱 가지의 대안을 제시하였다. This study is to examine TV historic contents and the alternative based on KBS documentary “Euigwe(儀軌), The festival during 8days” which was on air in October 2013. To sum up, in the case of produce TV historical program, it is a work of art based on writers’ creativity. Obsession with the historical research and evidence can be the barrier to block drama’s creativeness. On the other hand, Historical programs have great educational value related historical consciousness. Subsequently education and history fields emphasize objectivity and accuracy for historical research. Unconditional criticism is not necessary as both opinions are reflected the circumstances of the site for producing programs. However, the problem of occurred errors by historical research for TV history programs is that this kind of mistake is repeated for historical documentary which has to be most realistic. Six errors based on historic research from KBS documentary “Euigwe(儀軌), The festival during 8days” have pointed out with the facts that King Jeonjo’s body guards wear Japanese sword in Japanese way. To overcome the limit of historical research for TV Historic contents, seven alternatives are suggested with the solution such as setting pre-production system for broadcast contents and overcoming viewer rating supremacy. ● 투고일: 2014. 5. 7. ● 심사일: 2014. 5. 8. 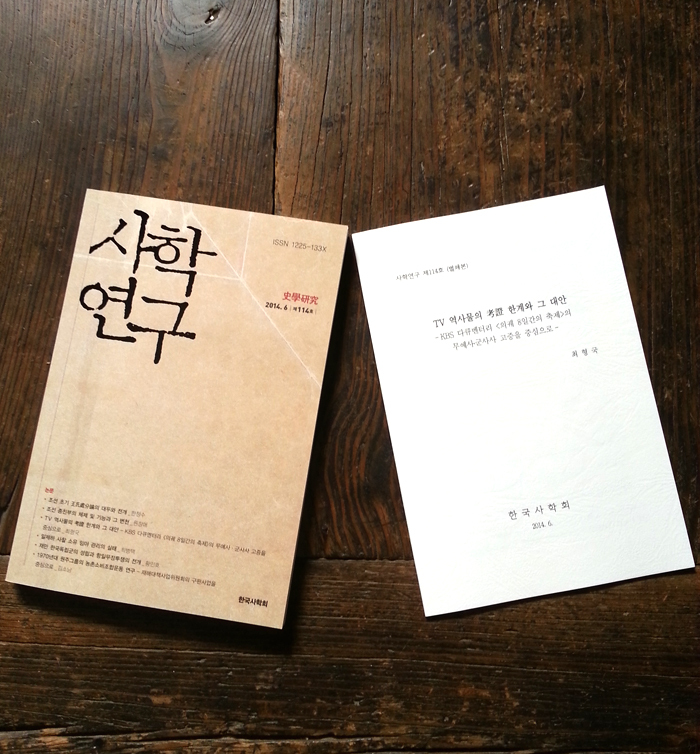 ● 게재확정일: 2014. 5. 22.